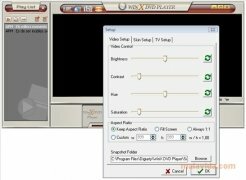 There are many multimedia players and practically all of them are compatible with DVD film discs, but not all of them are optimized for this purpose and have such a nicely designed interface as WinX DVD Player. The disc formats that are compatible with this minimalist player are DVD, VCD and SVCD, but what's more, it can play in file encoded in AVI, ASF, DAT, DIVX, MPEG, RM, RMVB, VOB, WMV, XVID,... so there will be no problem if we want WinX DVD Player to become our default player. It can read everything! Of course, the audio section has been very well cared to offer a sound player in AC3 with support for 5.1 multichannel sound. One of the most interesting features of WinX DVD Player is that it allows you to play DVDs from any area, so that even if we buy a disc in Asia, USA or Europe, we will be able to play it without any inconvenience, something that is very interesting now that it is so easy to get imported products o buying them during a trip.